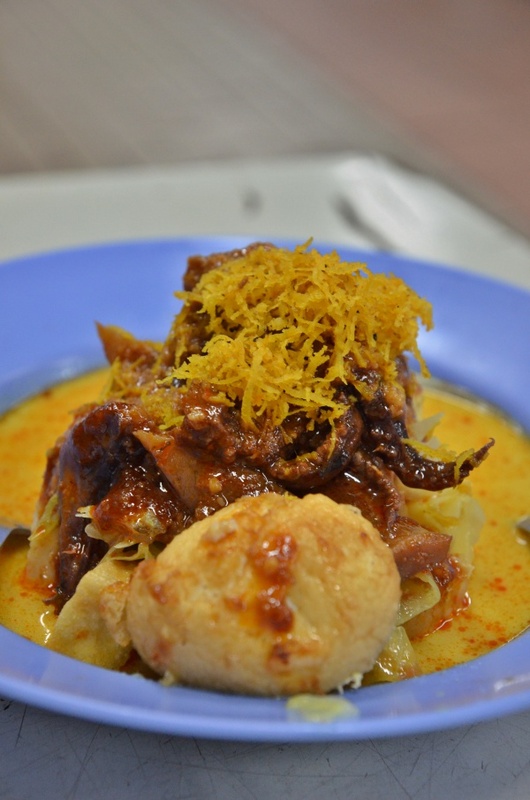 The “Lontong” from Gerai Mak Yah @ Section 14 Wet Market Hawker Centre has been repeatedly proclaimed as the BEST in Klang Valley. 40 years of legacy can’t be wrong. A case of growing addiction perhaps, but we see ourselves going back to the Section 14 (where Digital Mall is and the area where the new Jaya Supermarket will soon be operating from) for breakfast again; for 2 consecutive weekends. Last week, we tried Lum Kee’s Siam Laksa and Curry Laksa from the hawker food centre on the lower floor, while today we ventured over to the Halal portion of the area; where Gerai Mak Yah Lontong & Nasi Lemak seems to be perpetually luring in the breakfast crowd. It was barely 9am and the queue extended to a good 15 pax or so. Yes, service is DIY here. You walk up to the stall with the green signboard, get yourself in line and be prepared for the wait. Took me a good 15 minutes or so; with a dozen of hungry Lontong fans in front of me. And the question boils down to … was it worth the effort? What appeared to be an unpretentious, unassuming stall numbered P24 holds a grand four decades of history behind the name. You have to carry your own plate of ‘Lontong’ here. 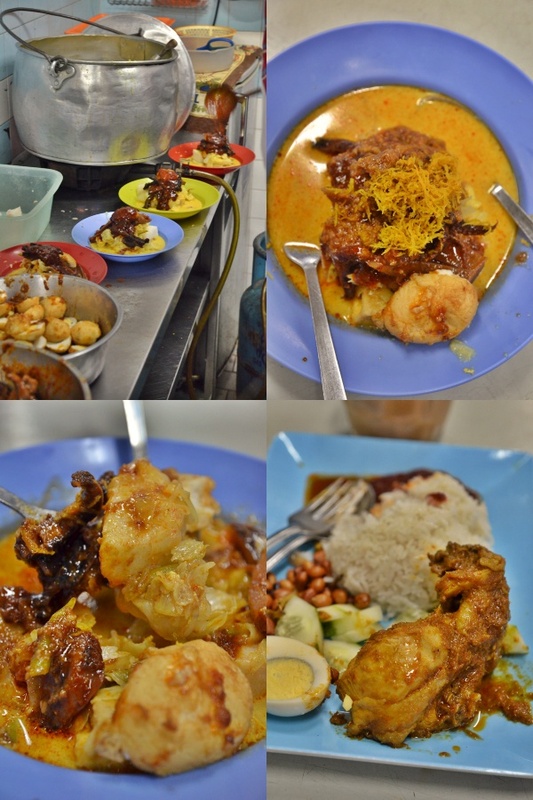 The options might sound scarce, but everyone goes for the same Lontong with Cuttlefish and Egg. You can opt to add a slice or two of beef, or offals like liver or even cow’s lungs. The man at the counter (son of Mak Yah; the proprietress) is one affable chap; gleefully chatting away with every single customer at the front of the line. 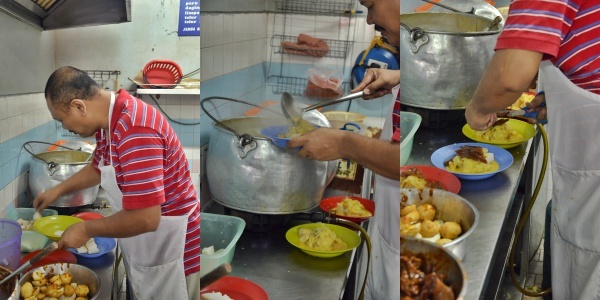 Not only that though, if you observe how he dishes up every single plate of Lontong, you would be smiling from ear to ear too. A rapid yet meticulous affair; he really went to the extent of performing his ‘plating’ skills here. Almost every portion was identical, and definitely fit for photography! First he picked up about 5 pieces of ‘nasi himpit’ or compressed rice cakes (imagine ‘ketupat’ but shaped into squares), then placed them on a plate at same level as the foundation for his ‘Lontong’. Then, he proceeded to scoop over some ‘sayur lodeh’ consisting of soft-boiled vegetables like cabbages and long beans in coconut milk and spices. Then in a flash, he would go cutting up some spiced cuttlefish (Sambal Sotong), half an egg that has been pre-fried, a piece of tempeh (fermented soy bean paste), bean curd and finally topping the ensemble with a handful of ‘serunding kelapa’ or roasted, desiccated coconut. You can also opt for a serving of ‘nasi lemak’ from Gerai Mak Yah, or like us we gave the business to the next stall. 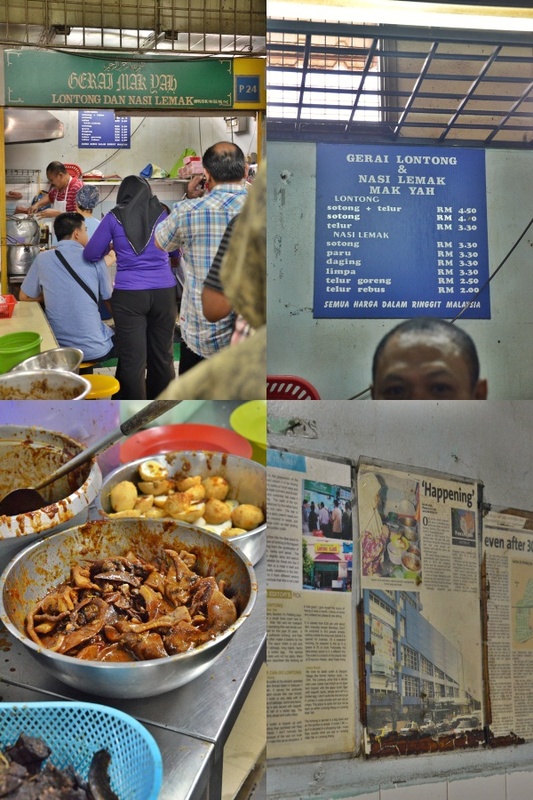 The “Lontong” here was definitely one of the best that I have tasted. The creamy, coconut milk-enriched gravy combined with the spicy Sambal Sotong and peanut sauce, plus the myriad of ingredients heaped into a pyramid-like structure rendered this plate of “Lontong” every bit of respect it deserves over the past 40 years. And for only RM4.50/USD1.50 per plate, there’s almost nothing to lament about. Other than the long waiting time, of course. Since this stall only opens for breakfast, and only up to 3 – 4 hours max, it’s wise to plan before you venture over for a hearty breakfast that may just keep you coming back for more. Section 14, Petaling Jaya, Selangor, Malaysia. The food court is in the same building on the first floor of the wet market in Section 14, a few doors away from Digital Mall. You can enter the food court from the staircase at the alley beside KFC. Opens from 7am – 10am daily, closed on Mondays and Tuesdays.